Freeze-drying—technically known as lyophilisation, lyophilization, or cryodesiccation—is a dehydration process typically used to preserve a perishable material or make the material more convenient for transport. Freeze-drying works by freezing the material and then reducing the surrounding pressure to allow the frozen water in the material to sublimate directly from the solid phase to the gas phase. The process of freeze-drying was invented in 1906 by Arsène d'Arsonval and his assistant Frédéric Bordas at the laboratory of biophysics of Collège de France in Paris. In 1911 Downey Harris and Shackle developed the freeze-drying method of preserving live rabies virus which eventually led to development of the first antirabies vaccine. Modern freeze-drying was developed during World War II. Blood serum being sent to Europe from the US for medical treatment of the wounded required refrigeration, but because of the lack of simultaneous refrigeration and transport, many serum supplies were spoiling before reaching their intended recipients. The freeze-drying process was developed as a commercial technique that enabled serum to be rendered chemically stable and viable without having to be refrigerated. Shortly thereafter, the freeze-dry process was applied to penicillin and bone, and lyophilization became recognized as an important technique for preservation of biologicals. Since that time, freeze-drying has been used as a preservation or processing technique for a wide variety of products. These applications include the following but are not limited to: the processing of food, pharmaceuticals, and diagnostic kits; the restoration of water damaged documents; the preparation of river-bottom sludge for hydrocarbon analysis; the manufacturing of ceramics used in the semiconductor industry; the production of synthetic skin; the manufacture of sulfur-coated vials; and the restoration of historic/reclaimed boat hulls. Pretreatment includes any method of treating the product prior to freezing. This may include concentrating the product, formulation revision (i.e., addition of components to increase stability, preserve appearance, and/or improve processing), decreasing a high-vapor-pressure solvent, or increasing the surface area. In many instances the decision to pretreat a product is based on theoretical knowledge of freeze-drying and its requirements, or is demanded by cycle time or product quality considerations. In a lab, this is often done by placing the material in a freeze-drying flask and rotating the flask in a bath, called a shell freezer, which is cooled by mechanical refrigeration, dry ice in aqueous methanol, or liquid nitrogen. On a larger scale, freezing is usually done using a freeze-drying machine. In this step, it is important to cool the material below its triple point, the lowest temperature at which the solid and liquid phases of the material can coexist. This ensures that sublimation rather than melting will occur in the following steps. Larger crystals are easier to freeze-dry. To produce larger crystals, the product should be frozen slowly or can be cycled up and down in temperature. This cycling process is called annealing. However, in the case of food, or objects with formerly-living cells, large ice crystals will break the cell walls (a problem discovered, and solved, by Clarence Birdseye), resulting in the destruction of more cells, which can result in increasingly poor texture and nutritive content. In this case, the freezing is done rapidly, in order to lower the material to below its eutectic point quickly, thus avoiding the formation of ice crystals. Usually, the freezing temperatures are between −50 °C and −80 °C (-58 °F and -112 °F) . The freezing phase is the most critical in the whole freeze-drying process, because the product can be spoiled if improperly done. In this phase, pressure is controlled through the application of partial vacuum. The vacuum speeds up the sublimation, making it useful as a deliberate drying process. Furthermore, a cold condenser chamber and/or condenser plates provide a surface for the water vapor to re-solidify on. This condenser plays no role in keeping the material frozen; rather, it prevents water vapor from reaching the vacuum pump, which could degrade the pump's performance. Condenser temperatures are typically below −50 °C (−58 °F). The secondary drying phase aims to remove unfrozen water molecules, since the ice was removed in the primary drying phase. This part of the freeze-drying process is governed by the material's adsorption isotherms. In this phase, the temperature is raised higher than in the primary drying phase, and can even be above 0 °C, to break any physico-chemical interactions that have formed between the water molecules and the frozen material. Usually the pressure is also lowered in this stage to encourage desorption (typically in the range of microbars, or fractions of a pascal). However, there are products that benefit from increased pressure as well. Freeze-drying also causes less damage to the substance than other dehydration methods using higher temperatures. Freeze-drying does not usually cause shrinkage or toughening of the material being dried. In addition, flavours, smells and nutritional content generally remain unchanged, making the process popular for preserving food. However, water is not the only chemical capable of sublimation, and the loss of other volatile compounds such as acetic acid (vinegar) and alcohols can yield undesirable results. 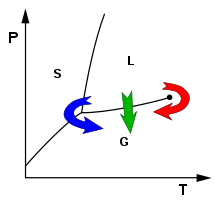 Examples of lyophilized biological products include many vaccines such as Measles Virus Vaccine Live, Typhoid Vaccine, Meningococcal Polysaccharide Vaccine Groups A and C Combined. Other freeze-dried biological products include Antihemophilic Factor VIII, Interferon alfa, anti-blood clot medicine Streptokinase and Wasp Venom Allergenic Extract. Many biopharmaceutical products based on therapeutic proteins such as monoclonal antibodies require lyophilization for stability. Examples of lyophilized biopharmaceuticals include blockbuster drugs such as Etanercept (Enbrel by Pfizer), Infliximab (Remicade by Janssen Biotech), Rituximab and Trastuzumab (Herceptin by Genentech). Although freeze-drying is used to preserve food, its earliest use in agriculturally based industries was in processing of crops such as peanuts/groundnuts and tobacco in the early 1970s. Because heat, commonly used in crop and food processing, invariably alters the structure and chemistry of the product, the main objective of freeze-drying is to avoid heat and thus preserve the structural and chemical integrity/composition with little or no alteration. Therefore, freeze-dried crops and foods are closest to the natural composition with respect to structure and chemistry. The process came to wide public attention when it was used to create freeze-dried ice cream, an example of astronaut food. It is also widely used to produce essences or flavourings to add to food. Because of its light weight per volume of reconstituted food, freeze-dried products are popular and convenient for hikers. More dried food can be carried per the same weight of wet food, and remains in good condition for longer than wet food, which tends to spoil quickly. Hikers reconstitute the food with water available at point of use. Instant coffee is sometimes freeze-dried, despite the high costs of the freeze-driers used. The coffee is often dried by vaporization in a hot air flow, or by projection onto hot metallic plates. Freeze-dried fruits are used in some breakfast cereal or sold as a snack, and are a popular snack choice, especially among toddlers, preschoolers, hikers and dieters, as well as being used by some pet owners as a treat for pet birds. Most commercial freezing is done either in cold air kept in motion by fans (blast freezing) or by placing the foodstuffs in packages or metal trays on refrigerated surfaces (contact freezing). Culinary herbs, vegetables (such as vitamin-rich spinach and watercress), the temperature sensitive baker`s yeast suspension and the nutrient-rich pre-boiled rice can also be freeze-dried. During three hours of drying the spinach and watercress has lost over 98% of its water content, followed by the yeast suspension with 96% and the pre-boiled rice by 75%. The air-dried herbs are far more common and less expensive. Freeze dried tofu is a popular foodstuff in Japan ("Koya-dofu" or "shimi-dofu" in Japanese). Freeze-drying is also used for floral preservation. Wedding bouquet preservation has become very popular with brides who want to preserve their wedding day flowers. There are essentially three categories of freeze-dryers: the manifold freeze-dryer, the rotary freeze-dryer and the tray style freeze-dryer. Two components are common to all types of freeze-dryers: a vacuum pump to reduce the ambient gas pressure in a vessel containing the substance to be dried and a condenser to remove the moisture by condensation on a surface cooled to −40 to −80 °C (−40 to −112 °F). The manifold, rotary and tray type freeze-dryers differ in the method by which the dried substance is interfaced with a condenser. In manifold freeze-dryers a short usually circular tube is used to connect multiple containers with the dried product to a condenser. The rotary and tray freeze-dryers have a single large reservoir for the dried substance. Rotary freeze-dryers are usually used for drying pellets, cubes and other pourable substances. The rotary dryers have a cylindrical reservoir that is rotated during drying to achieve a more uniform drying throughout the substance. Tray style freeze-dryers usually have rectangular reservoir with shelves on which products, such as pharmaceutical solutions and tissue extracts, can be placed in trays, vials and other containers. Manifold freeze-dryers are usually used in a laboratory setting when drying liquid substances in small containers and when the product will be used in a short period of time. A manifold dryer will dry the product to less than 5% moisture content. Without heat, only primary drying (removal of the unbound water) can be achieved. A heater must be added for secondary drying, which will remove the bound water and will produce a lower moisture content. Tray style freeze-dryers are typically larger than the manifold dryers and are more sophisticated. Tray style freeze-dryers are used to dry a variety of materials. A tray freeze-dryer is used to produce the driest product for long-term storage. A tray freeze-dryer allows the product to be frozen in place and performs both primary (unbound water removal) and secondary (bound water removal) freeze-drying, thus producing the driest possible end-product. Tray freeze-dryers can dry products in bulk or in vials or other containers. 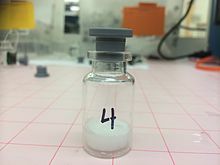 When drying in vials, the freeze-dryer is supplied with a stoppering mechanism that allows a stopper to be pressed into place, sealing the vial before it is exposed to the atmosphere. This is used for long-term storage, such as vaccines. Improved freeze-drying techniques are being developed to extend the range of products that can be freeze-dried, to improve the quality of the product, and to produce the product faster with less labor.